I didn’t get an iPod because I wasn’t a mac user yet. I wasn’t a fan of itunes (I’m still not a fan) and I hated the way iPods were “jailed” to itunes. 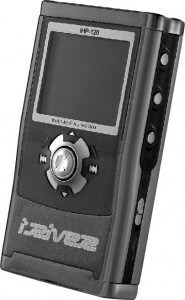 My iRiver was essentially a portable hard drive that I could stick any file on and carry with me. If it was a music file it would play it, no questions asked. One of the features of my iRiver, which initially I ignored, was a tiny little microphone. It didn’t look like more than a dot cut out of the plastic case. That dot would be my doorway into the world of podcasting. Using my iRiver I recorded spoken audio – just me talking into the mic – that I uploaded and distributed on my blog. If you want to hear how much of a novice I really was, you can find my early recordings listed on the right at the bottom of the sidebar. Fast forward to today and I have recorded more than 70 episodes of my show, most of which are interviews with other entrepreneurs. I stopped using the iRiver a long time ago, however podcasting remains one of my favorite methods to produce content on my blog. It’s a great tool for meeting other experts, learning from them and providing value to your audience. Podcasting is also a fantastic marketing technique. My podcasts are often shared between friends and sometimes when I interview someone prominent they link back to my site to inform their readers about it. It’s quick, relatively easy, makes for fantastic content and brings traffic to you. I’ve listened to a lot of podcasts from my industry and I’ve noticed that many of them, although providing some value, are often let down by the quality of the questions asked by the interviewer. I’ve compiled the following seven steps to help if you are considering running a podcast and interviewing people. These tips represent what I have learned as the best techniques for you to get the most out of the people you interview. The better an interviewer you are, the better the quality of your podcast, and thus your audience will really benefit from the content and share it with others. I’ll cover this first since people always want to know what tools I use to record my podcast interviews. I have a . I have a fantastic mic, , which slots into any USB port and should instantly be available in any software you use (you may have to select it in the audio options). I usually plug in a standard set of iphone/ipod headphones when conducting interviews so I can block out the ambient noise. That’s all I need for hardware. For software I use to call the person. Sometimes I use the function (you can call any phone with SkypeOut, but you will need Skype credit to do so), but most of my interviews are Skype-to-Skype. I just ask for the Skype username of my interviewee, we arrange a time and then connect. The benefit of Skype-to-Skype is the digital connection makes for better sound quality. You can also use Skype video to record video interviews. To record the call I use , which is a Mac only program for recording skype. Before switching to Mac I used Skype and the software to record my interviews using PC. Today for efficiency I record my calls and will say an intro and outtro at the start and end of the interview to remind people that they can get more podcasts from my blog. By doing this I don’t need to edit any of the interview post call, I can just take the raw .MOV file, convert it to MP3 using iTunes () or any MP3 converter (I sometimes use ) and upload it directly to my server. If something goes wrong during the call and I need to stitch two files together, or edit in an intro (I used to add theme music to my earlier podcast episodes), I use Garage Band that comes with Mac. When I was a PC user I used to do all my post-production editing, which is a free download. Currently I set my MP3s to MONO at 128kbps during the conversion process, which results in a high quality sound at about one megabit per minute in size (60 minute podcast is roughly 60meg download). If you are worried about filesize you can drop this to 64kbps or 32kbps and still retain quality. I also link the URL to a plain hypertext download link so people can save the file to their computer. I write a little description of the person I interviewed, highlight the best parts of the interview, add a photo and click publish. Done! The first piece of advice I recommend when it comes to convincing people to be your next interview victim is to simply ask them. Nine times out of ten this has resulted in a “yes” for me. If you approach really really famous people obviously you will face more resistance. It’s a smart idea to not approach the big players until you have some history behind you. This gives you the opportunity to practice, and also build some audience. It’s easier to convince someone to come on your podcast when you can say certain other respected people have already come on and you have X number of listeners. I also find referrals are a great doorway into the world of certain people. If you can’t reach someone directly, get to know a friend of theirs and ask for an intro. The more well known you are, the easier it is to convince people to join you for an interview. Networking works. Most of the people I interview either I meet in person at networking events. I’m introduced to through networking online, or I approach them after reading about them on another blog or website. Some, like , come to me when they have something to promote, and if I think their story is interesting enough I will record an interview with them. Just like when marketing your products and services in your business, you need to have a strong understanding of what your customers needs and wants are, where they come from and what language/style they use to describe their problems, when conducting a podcast. You need to consider all these things when interviewing. The better a job you do of this, the more popular your podcast will become. One of the key mindset shifts I make while conducting an interview is to get into the shoes of the “avatar” of my target audience. The avatar is an example of the typical person who listens to my calls, and in my case I always focus on beginners who want to learn how to start a business and make money online. While interviewing I think about whether the questions are being answered in enough detail for a beginner to understand. If the steps aren’t explained, or no examples are given, I ask the person I am interviewing to break these things down. This works particularly well when I am personally curious because I want clarity too. For example, when conducting an interview recently with , he explained how within two weeks of starting his business he had more customers asking to buy his service than he could handle, so he had to create a waiting list. 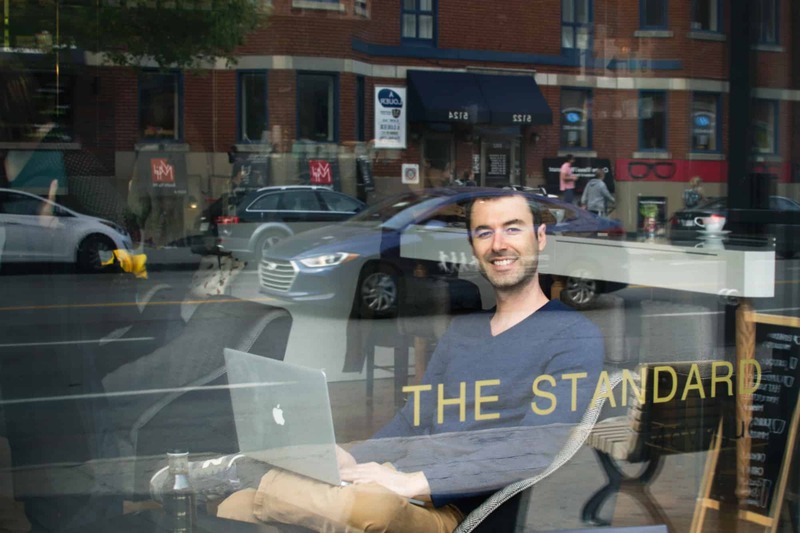 Naturally I asked him how this happened and he said the story behind his business (Virtual Dating Assistants) was picked up by various media outlets, including television coverage in the USA. If you’re like me, you’re probably wondering exactly HOW Scott managed to get this much press coverage. So that’s exactly what I asked him. He then proceeded to break down the process of how he went online and found the contact details for 150 journalists and emailed them all a template about his story. He even explained how he found the contact details, giving enough detail that a listener could replicate what he did. This level of detail is important, and most people you interview won’t automatically break things down for you. You need to ask them and keep asking them until you have the specifics. To help you do this, drop your presumptions and knowledge about the person you are interviewing and become your target audience. Then you will know what level of detail you need to dig out of the person you are interviewing. A key lesson I learned about conducting quality podcast interviews is to see the person you are interviewing as a story. You are there to help facilitate the revealing of their story to your audience. To begin this process I always ask my subjects to go back in time and take us through their lives to bring us up to date on their current project. Everyone I interview has some kind of key theme, something that makes them special and a real success story. Revealing how they became successful is important, and discovering how they came to the place of success by digging into their past is a great way to begin a story. You can use these questions as is or adapt them for your interviews. They should lead you to the next step, talking about their current success. Once you break down the history of your interview subject you can move on to the core reason you brought the person on the call. This part of the interview focuses on whatever successful project or reason that person is famous (or infamous). I find every person I interview usually has two “secrets” to reveal when it comes to whatever they are successful at. You have to be careful to cover BOTH aspects, not just one. Talking strategy is great, but often it’s more inspirational than practical. It gives people hope and motivation, but they don’t have anything they can actually take away and do. The practical steps make your podcast a training tool as well as a source of inspiration and ideas. Once you have broken down the entire process your interview guest went through for their current success and revealed their life story leading up to that success, you can begin to wrap up the interview. I like my interviews to go for 30 minutes to an hour at most, so I always keep an eye on the clock to see how things are progressing. Towards the end of the interview once I have everything about the core story explained, I use the remaining time to fill in any gaps I may have picked up on while the interview progressed. Often I’ll pick up on something that wasn’t fully explained but it wasn’t appropriate to stop them at that point. For example, I might ask them to explain their marketing technique in more practical detail, or talk about how they found their business partner, or even simple things like who built their website and how they found the people who work for them. Obviously these questions are relevant to the entrepreneurship industry. You should consider what are the major challenges in your subject area or you have personally experienced and whenever they come up during an interview, make sure you ask your guest to explain how they dealt with the issue. I end all my interviews by asking my subject to list any websites or resources of their own they want to promote. I sometimes ask them to explain what they are doing next (plans for the future), or talk about what a day in their life currently is like (again focusing on specifics) or ask if they have anything to say to a person listening to them who is at the start of the process they just went through. That last question is a great ending point because it’s always motivational and speaks directly to the listener. It’s nice to end on a high that leaves the listener eager to get out there and take action. The final piece of advice I have for you is to always ask “how” whenever you don’t understand how something was done during the interview. This one tip on some levels is all you really need to be a good interviewer. If you keep asking how, drilling things down, you will keep opening new doors to ask how about. Me: So how exactly did you come up with the idea for your blog? Guest: I realized I liked sowing so I started a sowing blog. Answers like that do not make for a long interview and don’t really give your listener anything to benefit from. In this example I would ask them more about how they learned to sow and what skills in particular are most challenging to learn. I’d then ask them how they built their blog, what platform they used, how often they publish articles, what sort of subjects are most popular, how they come up with ideas for content, where they found readers, etc etc. Every answer opens doors for more questions, it’s just up to you to decide which doors are the best to open. If you ever really struggle with a guest who just doesn’t give you in-depth answers I recommend you focus on one thing – get personal. All people, even shy people who don’t like being in the limelight still enjoy their own lives as a subject. Ask questions that flatter and show direct interest in the subjects that person cares about the most. Ask them to talk about where they were born, what they enjoyed growing up, what they are good at, what books they read, or anything specifically about them. A quick trip down nostalgia lane is a great way to get a person interested in opening up to you. I’m often asked if I do any preparation for my interviews, including whether I have questions ready to go in advance. The answer is no, I don’t. The only preparation I do is some brief research into the person I am interviewing so I know what they are most famous for and what websites they own. To be honest though, I don’t even need this info. You can begin an interview with anyone and deliver a great podcast without knowing a single thing about them simply by asking the right questions and follow-up questions. Right now I could ask you – “What are you most known for?” – and that would take us down a path to learn a lot about you, and make for a great interview, no matter how boring you think your life is. I’m naturally curious about people and I’m good at coming from the angle of a beginner, so I find conducting interviews on the fly is my preferred style. I feed off the answers of my guests and probe any subjects I feel are relevant or interesting. This works well for me and always results in a good interview. However don’t assume this is something you can do immediately. Interviewing is not a skill everyone is naturally good at, and until you get some practice your own nerves may stop you from being relaxed and in the flow with your guest. If you need a cheat sheet of questions to help you conduct your interview, that’s perfectly acceptable. I sometimes take notes myself so I don’t forget to ask something. You can prepare these questions in advance or even run off a template you use for all interviews. A word of warning though – using only prepared questions can lead to a disjointed interview. If you rely on prepared questions so much that your mind isn’t open to diverging down different paths based on how your interview guest responds, your podcast can feel quite stunted. Being relaxed and enjoying the interview like a good conversation, engaging with what your subject is saying and showing real curiosity, is the key to a natural interview style. One final reminder that’s important for all you people out there who love to talk – the interview is not about you. That’s all I do. Even when I tell my own stories I usually do so only as a means to summarize or repeat what was just said by my guest. If you find yourself dealing with awkward silence, don’t use that as an excuse to start filling the interview with your own voice. Keep asking questions. Follow the idea that you can never ask “how” too many times. 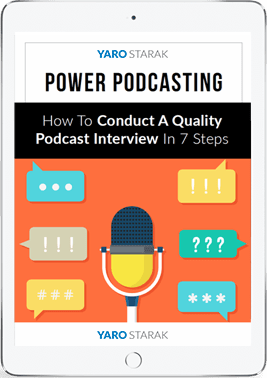 I hope these tips have given you some insight into how to conduct a quality podcast interview. The next step is to just get out there and do it. One of the most important skills to develop is comfort in front of the microphone when interviewing people. When you first do this it feels like you have a massive audience in front of you, even though it’s just you and your guest, so there will be nerves present. The only way to get past this is to do more interviews. Practice breeds comfort and a comfortable host makes for a better podcast. Oh my gosh, Yaro! This is incredibly helpful! I’ve gotten as far as buying a mic, and finding my first *victim,* but then I realized I wasn’t sure exactly how (just like you said re: the HOW being so important) to conduct my first interview, with the best possibility of it being usable and interesting to my audience. All the technical tips you gave are enormously helpful to get me going. Many of your other points and tips hadn’t even occurred to me yet. Thanks for saving me months of unnecessary trial and error. I’ll still need to experiment and fall into some ditches, but this info will dramatically shorten my learning curve, I’m sure. Happy to help Lailia. This post is a lot like a lesson I did in Blog Mastermind, I might use it as the basis of an update to that lesson. I have done videos and ebooks for my forum at the moment I do want to do some audio stuff so this post is very useful thanks. I now have my first audio incentive product idea, I can put this together quite easily just need to find someone to interview now. Great timing in my case for this super content, since I am exactly doing this now: having my first interviews for a new site regarding 4 Hour Workweek success stories. It’s really something one needs to get used to but as is with many aspects in life: the fear we have (or should I say the fear of fearing?) may hold us back from doing it. So having great advise from a proven expert is really very, very helpful. Hi David, I’m glad this post has helped and motivated you. I publish content to this blog roughly once a week, which has been my schedule for over a year now. The new benefit is that there are about 10 other great authors publishing content via their own column on this blog on the days that I don’t, so you just get more of everything. Their writing is different and their entrepreneurial stories are different to my own, but don’t make the mistake of ignoring their work because of that. There is some great stuff. If you like my style, try Dr Mani, Leevi and Nacie as similar. Thanks for the great post. Podcasting has become one of my favorite ways to stay informed and has become really useful during long commutes. I’m sure this post will help anyone looking to start their own podcast or become more familiar in how to produce a better quality podcast. Thanks Yaro. Another great how to post that I will definitely come back to. Love the Snowball USB mike. I used to create Japanese lesson podcasts when I lived in Japan. They were a lot of fun to create and I built up a large audience quite quickly. Also, they were a great way for me to promote several Japanese language products I made with my wife. I was pretty reckless with my podcast content. I recorded them on the fly at a cafe with a Japanese friend. We would just sit down and hit the record button without any preparation. My subscribers would get to hear us order breakfast and listen to conversations we had when we bumped into friends at the cafe. I plan to record interviews and make podcasts for the current blog I am working on. I really appreciate the complete guide you have put together in this post. You have inspired me once again. Many thanks. Happy to inspire Nick – and great subject you had in Japan, that would be perfect for podcasting. You could build a whole membership site around some aspect of learning japanese just by having conversation podcasts. I liked the part with people inviting, famous people are just people, and it is not necessary to create some unbelivable ways in order to talk to them, sometimes it is enough only to ask. 1. In tracking down famous people – I have found social networking (Twitter especially) as a great way to create a relationship and track them down. Many people that no longer read their own email still manage their own Twitter account, so you can reach them directly. Also – getting facmous people when they are in PROMO mode…when they are on a book launch or promoting a specific program is much easier than when they are between projects and likely working on development or some other aspect of their business. 2. You mention starting with bio information – that’s great, but I’m finding WAY too many podcasts (and video interviews for that matter) spending too much time on this and not getting to the meat of the interview/podcast fast enough. I would say 30s of intro is enough unless there is something extremely relevant about their background to the point of the podicast – otherwise get on with it. Thanks for extra the tips Jeff. I do like a long intro when it’s part of the story, telling you how the person became ready to do what they are now well known for. That being said, some stories are more interesting than others, so you do need to focus on the value, it’s different for different people. This is excellent and detailed advice, Yaro. Thank you very much for the steps. I intend to review the podcast you did with Tim Ferris. Hi yaro, awesome post. Podcasting gives great content, good information and knowledge. It is much easier to sink in the conversation because you just need to listen. Great tips on software and hardware that can be using on podcasting. Skype is very known for the good quality of sound system. I agree that you must not approach certain famous people until you have few known people that you have interviewed. Tim Ferris, 4 hour body is a known hit. I like how you say “One of the key mindset shifts I make while conducting an interview is to get into the shoes of the “avatar” of my target audience. The avatar is an example of the typical person who listens to my calls, and in my case I always focus on beginners who want to learn how to start a business and make money online.” Overall I like how you present this article. This is very much informative. Great piece of work here, I will bookmark this page and refer to it when I am ready to add audio to my blog. 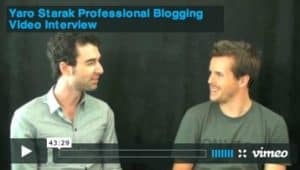 I am also interested in interviewing people that are successful that don’t have a blog. I personally know someone who ran a successful business and sold it for a mega-profit. I have to ask him if he would be interested in doing an interview with me. That’s the great thing about Skype, you can interview anyone who has a normal phone, they don’t even need Skype. Thanks for your comment Justin. A great article Yaro. Thanks for sharing! Podcasts are a fantastic way to build brand awareness and something I suggest to my clients as well. I love Audacity, which also is available for MAC users. [I haven’t used Garage Band yet, however it’s on my to-do list for sure]. Hi Annemarie, shoot me an email – [email protected] – and we can talk about scheduling an interview sometime. This was terrific and just the information I was looking for. I’m planning on adding podcasts to my blog in the very near future. Thanks for sharing this valuable information with us. Very Nice. This is a very useful guide. Thanks for taking all that time out to provide us with all of this useful information. Podcasting is quite a very interesting and useful topic that everybody should be aware of. Thanks for the tips Yaro. I am just about to approach some people to ask for interviews and to be honest I am scared to death. Thing is a few weeks ago I was terrified of making videos, but after trying it out I finally got the hang of it. When I first started out with IM your blog was one of the first I began reading. After all this time it is still the one I read the most often and enjoy the most. Once I get some experience at this I hope I can one day interview you. You make it sound very easy Yaro, but its really easier said than done. Perfect Time Post!….I was hungry to get the most effective steps for creating Podcast series for my contents and you have helped me a lot. Specially pre-podcast arrangement is very effective and useful. Great post today on the power of podcasting! I loved your point about the ease of using a USB microphone. It makes podcasting so accessible – who needs a rack full of mixers, compressors, eq’s etc. I personally use a Blue Yeti USB microphone (the snowballs bigger, badder, brother). Also – I’d like to recommend a great service for beginner podcasters called “Buzzsprout”.It’s a really easy podcast hosting solution that allows seamless integration into a WordPress blog. Oh and it also makes getting your podcast into ITunes a breeze. This is awesome Yaro. Thanks alot. I don’t think someone would say NO to your charm Yaro! 🙂 Thanks for the tips! I would keep them in mind. I just started podcasting myself and I have found, that I’m a bit nervous just before the podcast begins – especially if I’m interviewing someone. I guess that the nervousness goes away after being a bit more experienced wither interviews? This is very helpful information. I am currently doing teleseminars and this has given me some extra ideas and tips. thanks Yaro. you seem to have the ability to write just the post I need. I’ve gotten my feet wet with interviewing but in my mind I wasn’t framing it as a podcast. I suppose like many I am resistant to hearing the sound of my voice. Literally: I don’t want to hear it! The metaphor here is hard to ignore as “finding your voice” is usually the phrase to describe the writer’s journey. cheers! Great post as always! Though I have heard lots of podcasts, I wasn’t too familiar with how to go about in coming up with one. The post definitely gave me some useful insights to how it’s done and what exactly to do. I really loved the point ‘It’s not about you’, it’s so true that usually when we interview, we often conduct it from our own point of view which of course is not a smart thing to do. Thanks for sharing such useful information! Fas: You just do it and then it becomes easier. If you want you could practice by interviewing myself. Timo: The nervousness does go away over time. By the way if anyone is an expert in their field I would love to interview you. Just click on my name above and use the contact form. Excellent process, and right-on, Yaro. (as always). I’ve been “podcasting” email responses for two years now as well. The process has lead to numerous podcast interviews. And has greatly improved the connectivity with my clients and associates. (this means I actually answer my emails by recording my responses into my mic=>Audacity=>MP3=>Email Attachment). I then write a small intro sentence that says let’s the receiver know there is an audio attached. And a simple sign-off. 1) An upgraded mic can make a nice improvement in sound quality. The Blue Yeti (big brother to the Snowball) now costs under $100 on Amazon.com. The added warmth can increase listenability. And it gives a sense of greater connection with the listener. For serious work, I lean into a Rode Podcaster, which sounds like a $1,000 mic, but costs only a fraction of that. 2) Audacity also allows you to find the points where you may have excessive “breathing”, and subtly quiet those pieces. It’s almost automatic, so even a long interview can be “fixed in the mix” with 10 seconds of cleanup. Yaro, this was most definitely the BEST interview process outline I have seen. Many interviewers believe they have these “high points” they have to address, in some specific order. Which totally cuts the flow of the dialog. When in doubt, just watch old Charlie Rose interviews. He’s a master at pulling really juicy insights from his subject. Thanks for all you do, Yaro. Much appreciate your contribution to the blog world. This is really great Yaro. The article came right in time where I’m busy with the podcast for my site and will help me a lot to better my first interview. You’ve just given me the push to drive forward with a podcast project I’ve decided to start. I’ve created a handful of audio interviews before and released them as a product. But the idea of creating a podcast has been pretty compelling for me for a while now. Once you get over the nerves, interviews are truly the simplest way to create unique content whilst learning at the same time. Thanks again for the nudge. Perfect timing for me, I have been umming and arring about which is the best mike to get and there you go, you answer my question and provide even more info as well on interviewing. My blog is about health, so the questions would have a slightly different slant, but its easy to transcribe them. As usual a useful, well written piece with practical tips to get us started doing podcast interviews. I have begun doing interviews and I’m doing one today. I think what I was missing was getting the practical steps of how my guest did what they did. Thank you for that suggestion. I was focussing more on the inspirational aspect of the interview. I really love interviewing people, I too have been called naturally curious as I ask lots of questions, in order to get to know someone. It’s the only way. I am also doing video interviews, this is taking a little longer as I am teaching myself how to use final cut pro. I did a two day course recently and have produced one interview, which I’m proud of. Thank you Yaro, great post. Just stumbled upon this great article after having just ordered a blue Yeti USB mic. Anyone else here use one of these? The mic is awesome for podcasting, but the desk vibration for screencasting is a nightmare. Maybe I need to play around with it a but more – but when I type, it sounds like I’m using a sledgehammer and even moving the mouse sounds like shoveling gravel. I do have a hollow desk, which obviously aggravates the issue. It looks like Blue are actually creating a shockmount although they’re taking ages to get it to market. And they’re being really coy about a release date. I’ve linked to my full review in my name above if you want to read a fuller description. You probably already did your research though, right? I find podcast interviews (yours especially) very useful because they are more off the cuff which provides greater insight into the interviewees mindset. Quick question: How often do you suggest people conduct interview podcasts? – especially if they are starting out? Call Recorder, Pamela, etc are not the only option for recording Skype. If you already have Audacity or any audio recording software that can access your PC’s internal audio, you can record directly to it. I don’t know about MAC. Also, for some great mic reviews and samples, check out this blog. . It’s great to hear a bunch of great mics compared to each other. As a follow up, some OS’s may have a problem tapping into the PC’s internal stereo mix, so you might also try NCHs SoundTap. Interesting Marc, I hadnt thought of that. Do you know if they offer an overhead swivel type setup, or if there is a generic one available? I could see this noise contamination coming from the keyboard and mouse to be a real issue. Do you have this same problem at all Yaro? If so, got any solutions, or suggestions? Interesting Marc, I hadnt thought of that. Do you know if they offer an overhead swivel type setup, or if there is a generic one available? Perhaps raising the actual mic off the desk may help? I could see this noise contamination coming from the keyboard and mouse to be a real issue though, as I have a noisy keyboard! John, by the sounds of things you’re after a basic swivel mount studio arm microphone stand. I have a Blue Yeti and it fits on one of these no problem. If you’re in need of a stand I wouldn’t hold my breath for Blue to release one. There’s a heap of generic and more expensive (better quality) brand ones on the market. I have one that clamps onto my desk and gives me flexibility to move it to one side when I’m recording (cost me $49). You can also get ones that drill into the desk for more support. Excellent as usual Yaro, I’m really thinking of that snow mic you mentioned as I want to interview people on the financial freedom strategies they’ve used t build wealth. It is funny but I used to have exactly the same iRiver and sold it couple of years ago on eBay. When recording the call do you record your speakers with microphone or Call Recorder records the voice straight from the application to the file? I am thinking about doing podcasts but I am completely to the whole technical setup. I use Call Recorder too and it does record directly from Skype. But that will include any sound that comes from your computer speakers too, since your mic will probably pick up ambient sound. I always use earphones to eliminate the ‘echo’ you can sometimes hear with skype. Oh I agree! I hate how iPods are linked to iTunes! Even though I’m an avid user, I’m still having a difficult time using it! You’re wise to have chosen iRiver! Great post, very comprehensive description of each point, thanks for sharing this. I have bookmarked it for future reference. What a great post. There’s so much in here. It’s so useful to have the inspirational stuff and the really practical stuff all in one post. Fantastic. Thanks for posting. Hey Yaro,thank you for the rich tips here. I am interested in doing live in person interviews. Would you recommend doing an interview at a quiet restaurant. I am going to get a Rolland R-30 digital recorder and it has built in condensor mics, how do you do live interviews or how would you if you had to? I do all my interviews at home with my desktop mac and rode usb microphone. I prefer a quiet environment so I have no distractions. I’ve been wanting to do a podcast for a long time now. I do voice over work as a part-time thing and therefore have all the equipment and know-how when it comes to narration and post production. My challenge is coming up with a good podcast idea to launch. I love the interview idea, but knowing myself, I’m always so insecure when I think of approaching people for an interview and then I fear the interview will turn out disastrous! So I’m therefore trying to come up with something that I can do alone, but that isn’t dry and boring to the listener. Thanks for this article. As always, I have learned something great from you! Был найден мной популярный интернет-сайт на тематику www.agroxy.com.